Fun Quilter 17 has 17 inch throat depth, front and rear handles, speed control, front and back hand wheels, aluminum construction. Nolting Fun Quilter 17 Long Arm Quilting Machine. 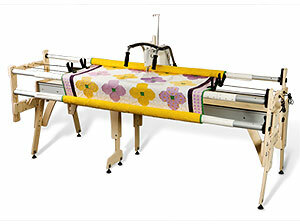 The Fun Quilter 17 is one of three sizes of longarm quilting machines offered by Nolting Manufacturing. It is the latest evolution of machines made for the home user. The Fun Quilter can be purchased with or without the optional stitch regulator. Machines with the optional Equalizer stitch regulator can work on the Nolting Commercial frame, Hinterberg Stretch frame, and Grace Pro frame. Fun Quilter has been developed to work on nearly all the larger machine frames. This makes it easy to upgrade your system to a larger, newer or stitch regulated Fun Quilter. 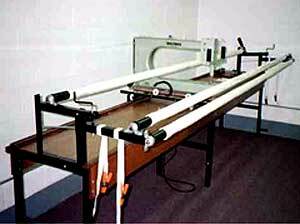 A Fun Quilter on a Nolting commercial frame can easily be upgraded to a larger commercial longarm machine in the future. Nolting Fun Quilter 17 Features. 17 Inch throat depth, with 8 inches of inside height. 4 Inches wide x 23 inch or 26 inch long flat bottom can sit flat on your carriage. Drilled holes to attach the popular circle makers. Hand wheels in front and rear. Fluorescent light above the needle. Fits most TableTop quilting frames. Nolting Fun Quilter 17 Package Contents. Machine, bobbin winder, bobbins, needles, patterns, pointer, clamps, clear vinyl pattern cover, oil, batting roller, and manuals. Nolting Fun Quilter 17 Options. Machines with the optional Equalizer can work on the Nolting Commercial frame, Hinterberg Stretch frame, and Grace Pro frame. Equalizer stitch regulator by Intellistitch®. The Equalizer features the needle up/down button, standard speed control, and stitch regulation. Nolting Fun Quilter 17 Information.